23 May 2018 – Hong Seh Marine closed record sales in 2018, with the sale of a Riva 76 Perseo and a few brokerage boats following a successful Singapore Yacht Show 2018. 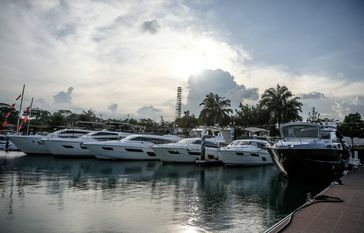 Celebrating the debut of several luxury yachts in Singapore at the Singapore Yacht Show, Hong Seh Marine hosted cocktail evenings for clients and industry partners from Ferretti, Cranchi and Boston Whaler. “We are pleased to debut new yachts as well as signature bestsellers such as the Cranchi Trawler 43 at the Singapore Yacht Show 2018. The show is increasingly becoming an important one as the yachting lifestyle grows exponentially in South East Asia,” says Edward Tan, Group Executive Director, Hong Seh Group. The company’s official announcement of a partnership with Pacific Radiance, a division of CrestSA Marine & Offshore Ship Repair, was met with enthusiasm from the industry and clients alike. The first full-service facility in Singapore will have capabilities of handling build up and service repairs of superyachts. Providing haul up and hot work services for yachts over 90 metres long, the 30,000 square-metreshipyard has two dry docks – a 90m and a 100m long berth. The shipyard also has a 95m to 120m water frontage for afloat repairs and services as well as two 32-tonne dock and wharf cranes. Additionally, the shipyard is equipped with facilities for equipment fabrication, testing and maintenance and will house Hong Seh Marine’s project management team for third-party vessels built both locally and internationally.